Create easy to use albums and instantly upload photos and videos from your classroom, outdoor outings or from anywhere you wish. Share images of your children’s artwork with their parents. All done in a flash from your smart phone! Parents have all their children’s school photos and videos in easy to use and easy to access albums. Sharing is really simple too. Send messages to all the parents of the children in your class. These are not conversations, just simple teacher to parent messages. So useful in case of emergency or the unexpected. 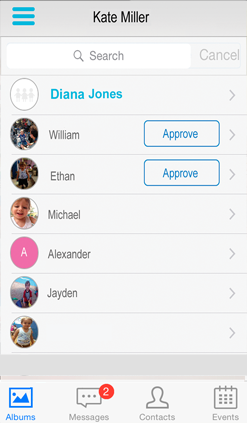 All the contact details of the parents of the children in your class in one easy to access and easy to use list. Contact parents directly from the Contact List via phone, sms or email. 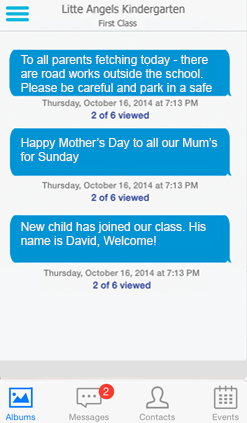 Class parents have simple access to all the contact details of their fellow class parents too. The Apparent Class Calendar is so cool. The calendar automatically adds all the children’s birthdays, and the teacher can add in-class activities and outdoor excursions, as well as relevant meetings and school events. 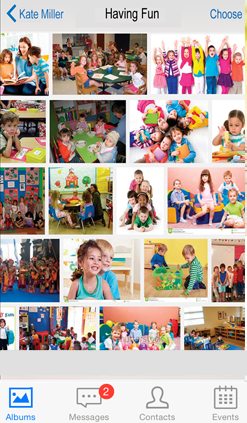 At a glance, parents can see all the activities relevant to their child’s class and school. 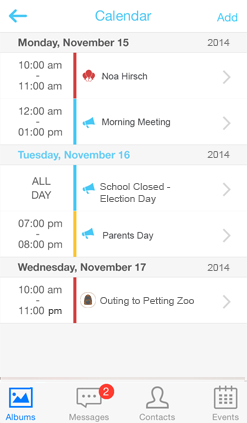 And events can be instantly added to your default phone calendar too.